Maciej Lewicki scored two goals and Ryan Lamb made 11 saves, a few of them spectacular, as the No. 2-seeded Hawks (13-2-3) defeated No. 3 Naugatuck, 2-0. 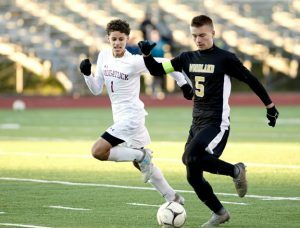 Woodland returns to the NVL title game for the first time since 2014. Lewicki took advantage of two Naugatuck (11-4-3) defensive miscues to score in the ninth minute, and then again in the 43rd. After that it was time to defend. Lamb made eight of his 11 saves in the second half, including a one-hand save on a blast by Kareen Morris. The Hawks will play No. 1 Watertown, a 4-0 winner in the other semifinal game over No. 5 St. Paul, on Thursday at 5 p.m. at Naugatuck High School for the championship. The teams met once in the regular season, a 2-1 win for Watertown on Oct. 5. In the girls tournament, No. 5 Woodland fell to No. 1 Watertown, 2-0, in the semifinals Tuesday at Watertown High School. 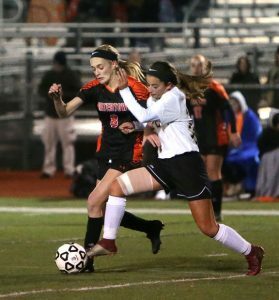 The game was scoreless at halftime before Watertown’s Emma Kite scored twice in the opening seven minutes of the second half to give the Indians the win.